Michael Bashkin builds three standard guitar models: The OM, The OO, and The SJ. With a wide choice of sizes and body styles, these original Bashkin designs can be customized extensively to match your playing style and provide an instrument that will feel comfortable even after many hours in a single session. Which is the right guitar for you? Whether you’re a raucous Flat-picker or a Fingerstyle player with a soft touch, you’ll find that all Bashkin guitars project a rich and complex voice. Fundamental notes and overtones are meticulously balanced. The tone is full and unbiased. In your hands the guitar is extraordinarily responsive and powerful as it faithfully expresses your personality. Explore each of our guitar models, standard features and customization options below. 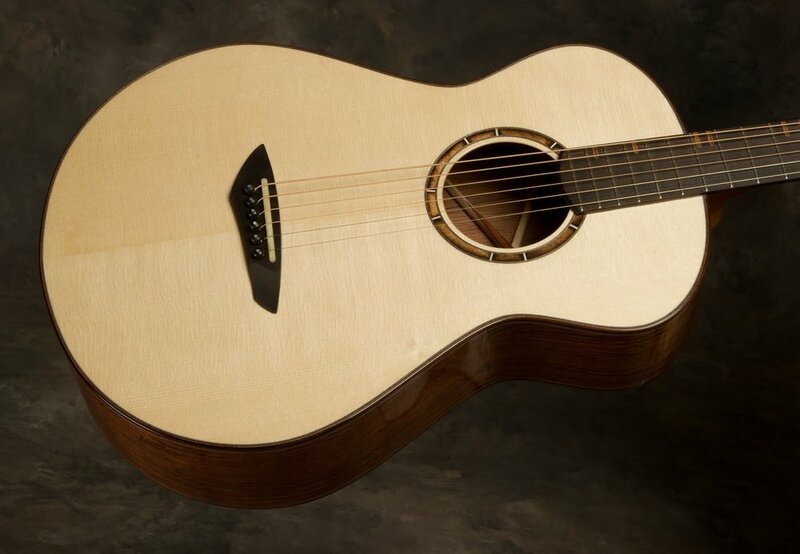 A MODERN TAKE ON THE CLASSIC "Orchestral Model"
A fingerstyle player's delight, the OM is an exceptionally comfortable instrument with excellent note separation and balance making it ideal for composing and recording. Michael's largest guitar is a compact, Jumbo-sized beauty with a balanced sound that delivers enormous depth, warmth and presence. An articulate, well-balanced, small-bodied fingerstyle guitar with a fast response and sweet tone that belies its size - and works well for a variety of playing styles.